I can’t believe that it’s two months since I last posted something on my blog. My excuse is that I hate cold weather and I have a tendency to hibernate over winter, only venturing forth on nice sunny days to prune something before scurrying back to the fire. Winter hasn’t been entirely unproductive though. 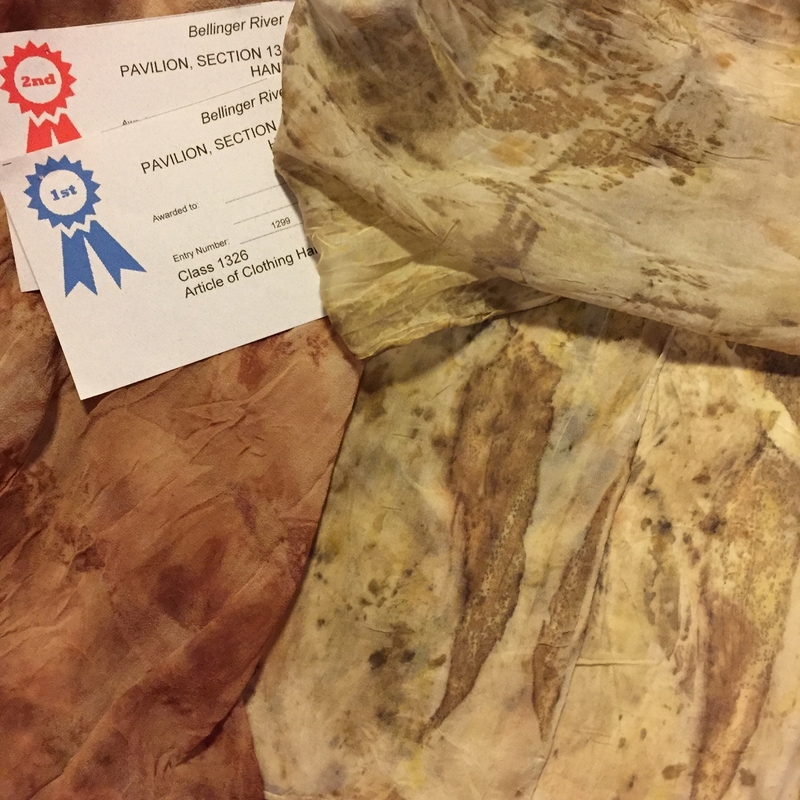 Two of my eco-dyed scarves won a prize at the Bellingen Agricultural Show. It’s not exactly the Sydney Show but who cares! The display was mounted by the Mixed Up Art group as part of Readers & Writers week. 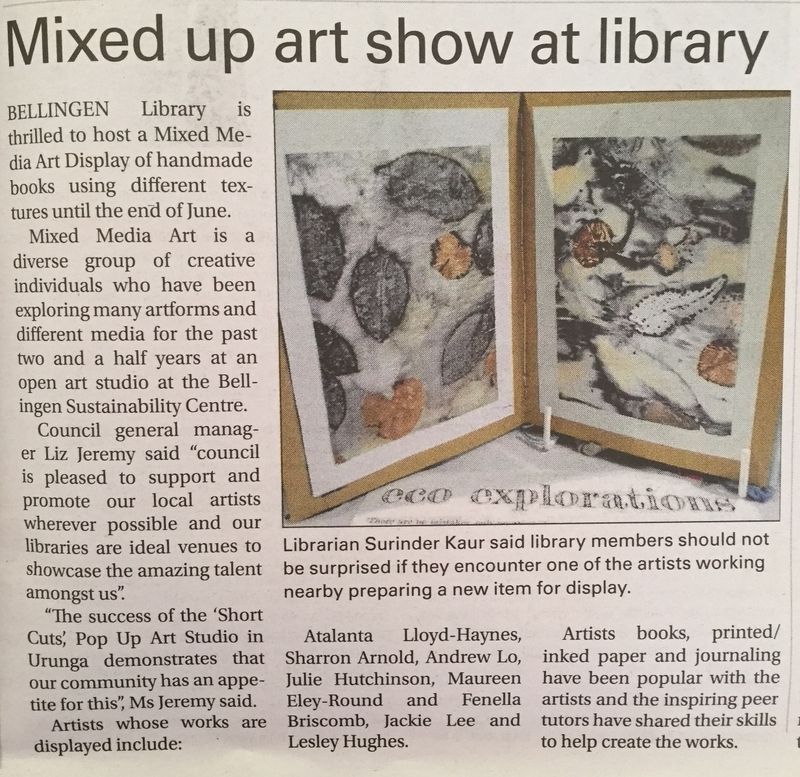 The group held a bookbinding workshop in May, and whilst my bookbinding/sewing skills would benefit from some (a lot) more practice, the book held together and much to my surprise was featured in our local paper. On rainy days, I have been experimenting with leaves gathered from the garden and on my morning walks. Some leaves were disappointing – yielding absolutely no colour – but others such as Ornamental Maple and Native Tulipwood rewarded me with soft silhouettes, Geranium varied leaf by leaf, steamed Purple Carrot worked well, but sometimes the bundle wrapping was more successful than the fabric piece. The “compost experiment” failed primarily because I forgot about it. By the time I dug it out of my compost heap, the bugs had munched on the silk and the bacteria had broken down the fibres. Note to self: write a reminder in your diary! Lovely blog and photos Fenella. You are inspirational. Thanks Helen – I am working up the courage to tackle a wool wrap. I’m a bit worried that I’ll ruin it! This all looks like so much fun! 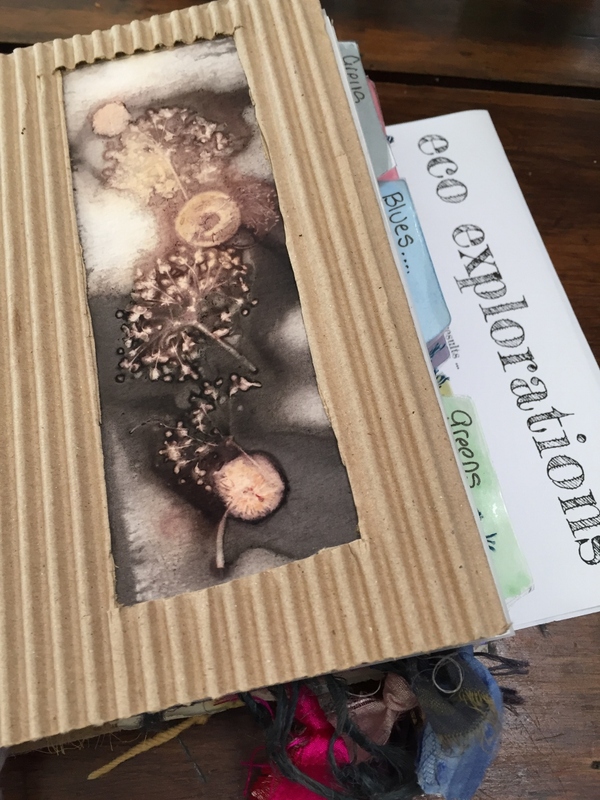 I love the creativity of your artist’s book. And I forgot to mention that your final product looks stunning! Thanks Esther – I’m still a bit hit and miss at the moment. The results are always interesting but often not what I had imagined.